Here are some questions that may be worth asking before choosing a drone parachute to ensure proper operation and ease of use. Which size for the parachute? 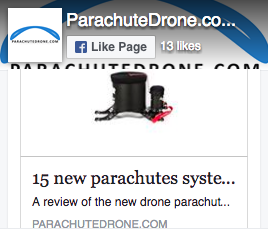 This is a crucial factor when choosing a parachute kit. The canopy area will determine how fast your UAV will hit the ground in the event of a problem. Fortunately, the " reasonable " impact speed is already determined either by the regulations in force in the country where you want to fly or by the parachute manufacturers. These fall rates are supposed to minimize the damage especially towards people that the drone could hit while falling but it is not guaranteed that it will totally spare your equipment, if you carry sensors very sensitive to shocks you may want to increase the surface. On the other hand, if the flight does not depend on any regulations and your UAV and its load are rather robust, it is up to you to reduce a bit the surface and therefore the weight and space requirement of the parachute. Here is a table that shows an approximate value of the fall rate as a function of the surface of the parachute and the mass of the drone. This value is approximate because not all parachutes are made the same, it is in particular their shapes that diverge (round, square, Rogallo) but other features are also to be considered such as the presence of a chimney (the hole in the centre of some parachutes) which will affect both the stability of the parachute but also its drag coefficient. However, this drag coefficient is not often indicated by manufacturers. Will the drone support the extra weight of the parachute? All parachute kits are designed to be as light as possible but it still adds an average of a few hundred grams to equip a drone with a parachute. If you built your drone yourself, it is up to you to decide whether to modify the engines/propellers/ESC but most of the time it won't be necessary due to the limited weight of parachute kits. 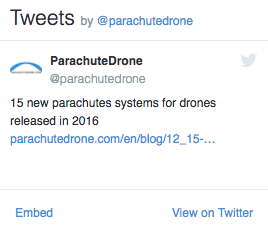 The question will be less relevant for large drones, on which 200 or 300 additional grams are almost negligible. On a drone ready to fly as a DJI phantom for example, although the manufacturer designs it so that it flies at its best efficiency (camera included), it is still possible to add a few extra grams while maintaining acceptable flight properties. The engines will heat slightly more and the flight time will be reduced by 2 or 3 minutes but nothing dramatic. There are several deployment systems, some deploy by ejection and others by gravity. The most common is spring ejection, a simple and reliable system that has the disadvantage of using a metal spring that can be somewhat heavy. This type of ejector is the most widespread, it is a system that due to its simplicity and high successful deployment rate, these are highly efficient springs that send the parachute far enough away to ensure rapid deployment. Moreover, since the parachute is sent away from the drone, we are sure that it will have all the necessary clearance away from the aircraft. It is also easy to handle and it can travel by plane. However, it can be a little more complicated to re-install after ejection and re-folding, as the spring is often very compressed, fortunately this is not something that needs to be done every day. Other parachute kits use a pressurized gas ejection system, usually CO2, similar to those found in Sodastream type soda machines. These cartridges have the advantage of being lightweight and the ejection is extremely efficient and ultra-fast. However, their handling, although very safe, is always a little anxiety-inducing. Another disadvantage is that it is not possible to transport these cartridges by plane. These are several reasons why, although very effective, this system is becoming less and less widespread. Gravity deployment. It is the most simple system, the parachute is not ejected but simply released, the gravity and the aerodynamic drag then comes into action, the parachute falls and the air rushes inside (the parachute is folded and stored in order to optimize the opening). This system, which, while seemingly rudimentary, is effective and well proven. It has the advantage of being reliable and lightweight. What kind of triggering? Manual or automatic? Manual activation. Through a remote. This can be the aircraft's main transmitter, the same one that is used to pilot the aircraft, or a transmitter dedicated exclusively to the parachute. This second option is often preferred. When you want to deploy the parachute, it is often because of a drone failure and if there is a drone failure, there may also be a failure of the receiver or the flight controller. A separate triggering system ensures greater safety through redundant systems. This is the option chosen in France by the Direction Générale de l'Aviation Civile (DGAC / Governement Aviation Agency), which requires a separate communication system for the parachute. Automatic activation. This system is composed of an electronic board equipped with accelerometers and gyroscopes, as in smartphones, which measure linear velocity and angle variations to detect when the drone falls. The fall is detected much more quickly than by humans, first because the computer reacts faster but also because when flying, the drone is often far away and can be hard to detect altitude variations. Finally, panic often leads us to lose our means and although we have analyzed the situation, we do not always make the necessary decisions or not fast enough. One can be a little hesitant at first to leave such a crucial aspect of safety to a machine and rightly so, computers also make mistakes. What happens if you fly fast with sudden maneuvers and the sensors assume that the drone is in free fall when it is merely a slightly aerobatic flight? This is the reason why this type of automatic activation system is not available in "sport" mode on some drones. Will it be possible to shut down the motors? Is the parachute compatible with the drone's flight controller? A motor cut off system is recommended when the parachute is deployed. However, it is not always easy to perform this type of modification on a drone and it is certainly possible to activate a parachute without shutting down the engines if the system has been designed with this in mind. If the parachute is ejected far enough from the propellers and the parachute attachment strap is properly designed then no problem, the engines will keep running but with no influence on the parachute. On the drones that allow it, we prefer to cut off the engines, ideally without completely cutting off the power supply to the drone so that it can then be found using GPS and telemetry. On some UAVs such as Phantom 3, it is possible to switch off the engines using a Combination Stick Command (CSC) with both transmitter sticks positioned inwards and downwards. On other drones, this will depend on the flight controller. On Ardupilot, for example, it is possible to configure the engine shutdown using the remote control, automatically, or via the Ground Control Station. Another way, more hardware-oriented and reliable, is to use a system dedicated to shutting down the motors. It consists of an electronic board that interfaces between the PWM outputs that control the ESCs of the engines and will receive a PWM signal (either by an automatic triggering system or by a transmitter). In normal times this card does nothing and just lets the instructions pass through as if it were not there. When activated, it overrides the flight controller and orders ESCs to stop the engines, this type of card can also control the ejection of the parachute and the activation of a buzzer to signal the fall. Does the parachute need to be easily removable? It can be useful to be able to mount and dismount the parachute kit easily. Either because you only want to use the parachute when the regulations require it. Either because sometimes you need a little more lift capacity and if you happen to be in a scenario where a parachute is not mandatory, you could save a few hundred grams by temporarily dismounting and be able to carry a heavier camera or lens. Most of the parachute kits available on the market are designed for this purpose, they are installed on a mounting kit on which the parachute is then attached. The fixing kit is permanently attached to the aircraft and the parachute is mounted/dismounted as required to suit the use. That' s for the parachute aspect, but we also have to consider the parachute control system as well as the motor cut-off system. As for the engine shutdown part, it will probably remain installed on the drone, not weighing much and being tricky to install. It will therefore be necessary to simply reconnect the PWM cable to the parachute kit beforehand. Regarding the power supply, the most convenient option is to choose an external power supply, a mini Li-Po battery dedicated to the parachute, which will have a number of benefits: the redundancy of the power supply improves safety and the parachute system is more autonomous and it will be easier to remove or install it on another drone. However, it will be necessary to check the correct charge of the battery before each flight. What are the regulations where I want to fly? How to power the parachute? The ejection system will always need a power supply, at least to move the servo that holds the spring, but the power supply can also be used for a receiver dedicated to the parachute, an automatic triggering device or a buzzer indicating the fall of the drone, whichever system is used, a power supply is needed. In general the power supply must provide between 4.8V and 6V, this is the operating voltage of most servos, receivers and trigger boards. Most drones and flight controllers are equipped with 4.8V - 6V power supplies and should already have a connector available if this is not the case, it is very simple to add one. But powering the emergency system (parachute) with the main system (drone/flight controller) is not necessarily the best idea. If one has to activate the parachute it is very likely that this is because the drone is defective, in this case, can you trust the drone to activate the parachute kit? Of course no, therefore the power supply used to power the parachute system should be independent of the aircraft's power supply. Once again, redundancy will provide more safety but also more simplicity if you need to be able to easily mount and dismount the parachute kit. A completely separate, separate, autonomous parachute kit will be more detachable, more secure (redundancy) and easier to install and configure. As in computer security, convenience is essential, if a security system becomes too complex to use, we usually find a way to bypass it, and not use it anymore.